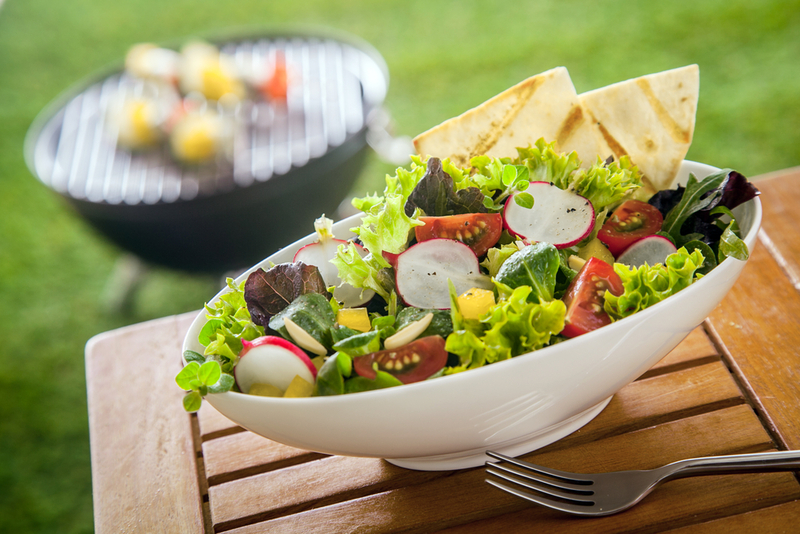 With summer well and truly here, we all tend to eat more salads than during the winter months. However, if the thought of yet another plateful of leaves fills you with boredom, or even dread, then think again! 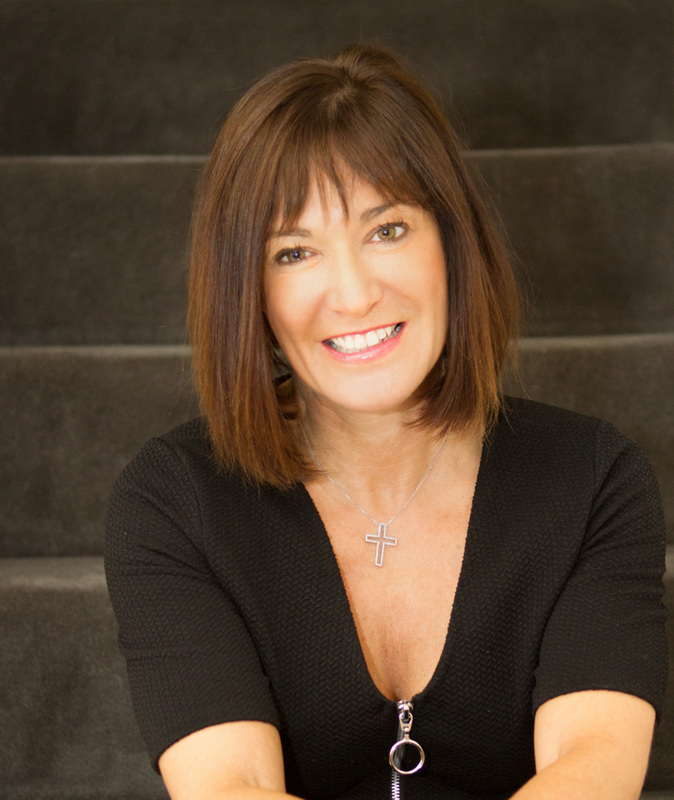 Clinical Nutritionist, Suzie Sawyer, gives us her top five salad recipes with a difference. 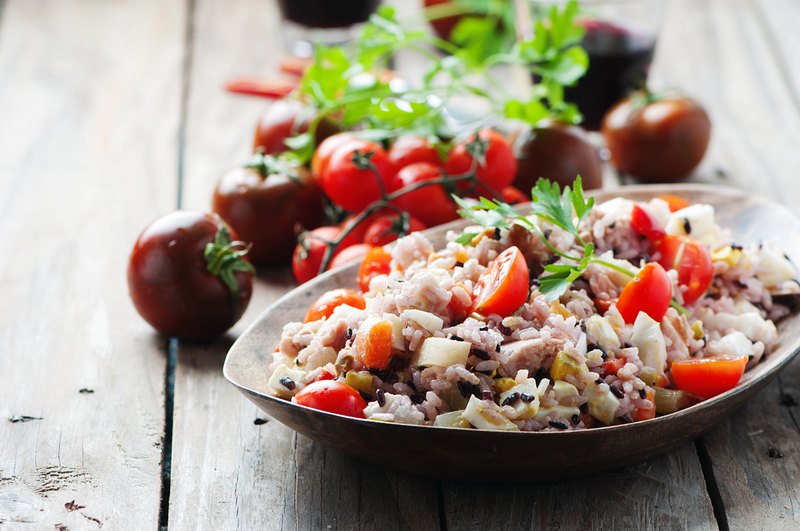 Depending on how many you want to feed, you’ll need some brown rice, eggs, large tomatoes, a green pepper, olive oil, freshly squeezed lemon juice, mint leaves and black olives and some canned tuna in brine. This is a variation on a Tuna Nicoise salad. All you need to do is to cook the rice as per the instructions, hard boil the eggs and chop the tomatoes, pepper and olives. Add everything together with the tuna, olive oil, lemon juice and chopped mint and you’re ready to go. This recipe is high in protein with the tuna and egg, so you’ll feel fuller for longer, plus the addition of the rice makes it a sustaining and tasty meal. Brown rice contains so many more B vitamins than white rice, which are great for energy levels, and the salad vegetables, with their lovely dark colours, contain a wealth of nutrients, particularly antioxidants, to keep you looking young. So it’s a super-salad all round! 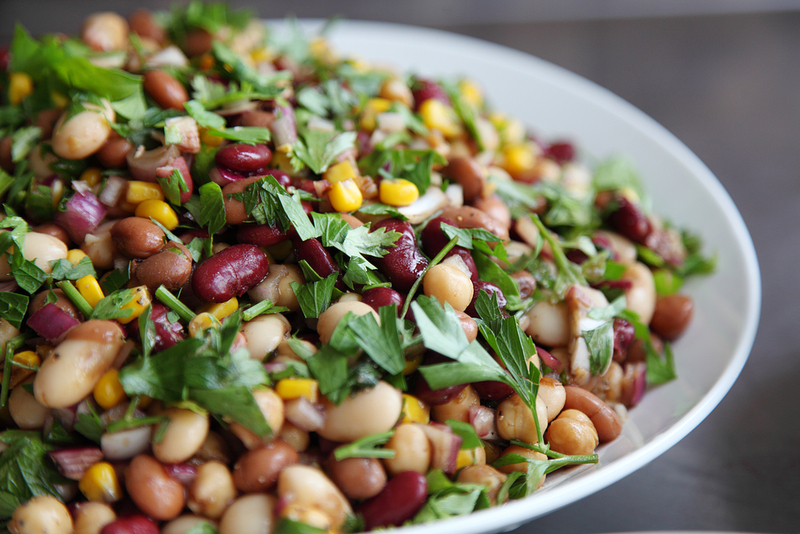 There are so many varieties of beans and all of them provide great health benefits, so you can mix and match whichever beans you like in this recipe! Beans provide some good levels of protein, so are really popular with vegetarians, as well as containing good levels of minerals. Even better, they contain phytoestrogens which are especially helpful for women to keep their hormones in good balance. For this recipe use canned mixed beans, a large tomato, one finely chopped fresh red chilli, some chopped coriander and some fresh green beans which should just be lightly steamed. Then mix all the ingredients together with a dash of soy sauce, salt, lemon juice and olive oil. Eat it on its own or add some meat of your choice for an extra protein hit. This makes a great lunch time dish which is easily transportable and will keep your blood sugar levels balanced all afternoon. For those who feel the need for leaves, and there’s plenty of good reasons to eat them, then try being a bit more creative. Think baby spinach, small trimmed broccoli florets, shredded white cabbage, sliced cucumber and rocket. For a little twist, you can also crumble some blue cheese over this and maybe some chopped walnuts. This salad also works really well with a pesto dressing – use pesto, lemon juice and olive oil – and you’ve created something truly amazing! 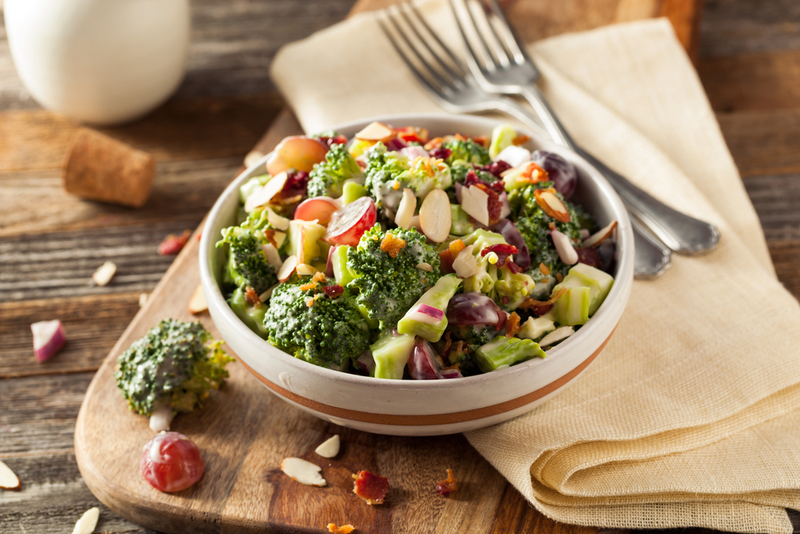 As Popeye knows, spinach is a great source of iron but broccoli is a true ‘superfood’. The fact that you’re eating it raw helps to retain more of its nutrient content, particularly the vitamin C, which is often destroyed during cooking. This dish is really colourful and great to eat all year round. You can either keep it as a mixed roasted vegetable salad or add some rocket to get the ‘green’ hit! 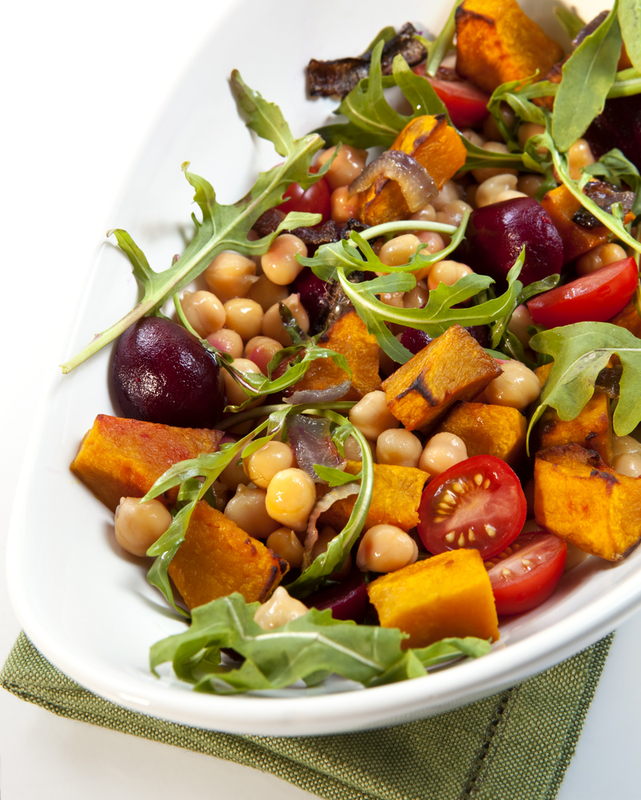 The mainstay of this salad is sweet potato. Sweet potatoes contain many more nutrients than the traditional white potato, partly due to their deep colours. They are also rich in carotenoids which produce vitamin A in the body – great for the skin, eyes and immune system. Slice the potato and roast in the oven with some red peppers and onions if you fancy it. Leave to cool and then mix some chopped beetroot, rocket, olive oil, balsamic vinegar and salt and pepper and add to the mix. Delicious! There’s almost nothing better than the taste of ripe, on-the-vine tomatoes! You can get some really tasty ones from supermarkets, or why not try your local farmer’s markets? Tomatoes are rich in lycopene which is a powerful antioxidant and they’re also packed full of a range of vitamins and minerals. One helpful buying tip is to give them a good sniff before you buy them to make sure that scent is just perfect and then they’ll taste wonderful too! 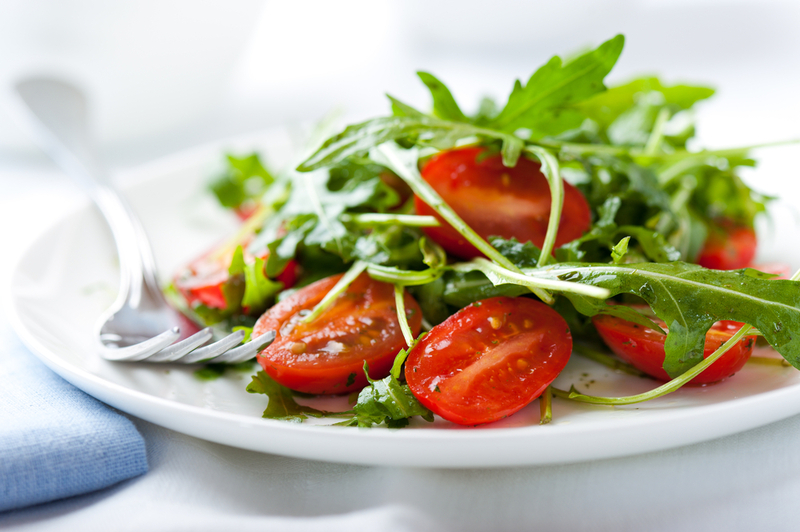 For this tasty salad, all you need to do is to slice some tomatoes, add chopped basil and crushed garlic, with some rocket leaves and mix together with some olive oil and salt and pepper. It really is as simple as that but it’s actually all about the taste of the tomatoes. This also makes a great side salad to pretty much anything you might want to eat! So, why not get creative with your salads this season and you’ll never get bored of this summer staple!